I rarely share army lists, as I don't play that much, but after finding out that my original force did not have two troops choices due to one of them not filling the compulsory slot, I painted up a 15 man strong tactical squad. 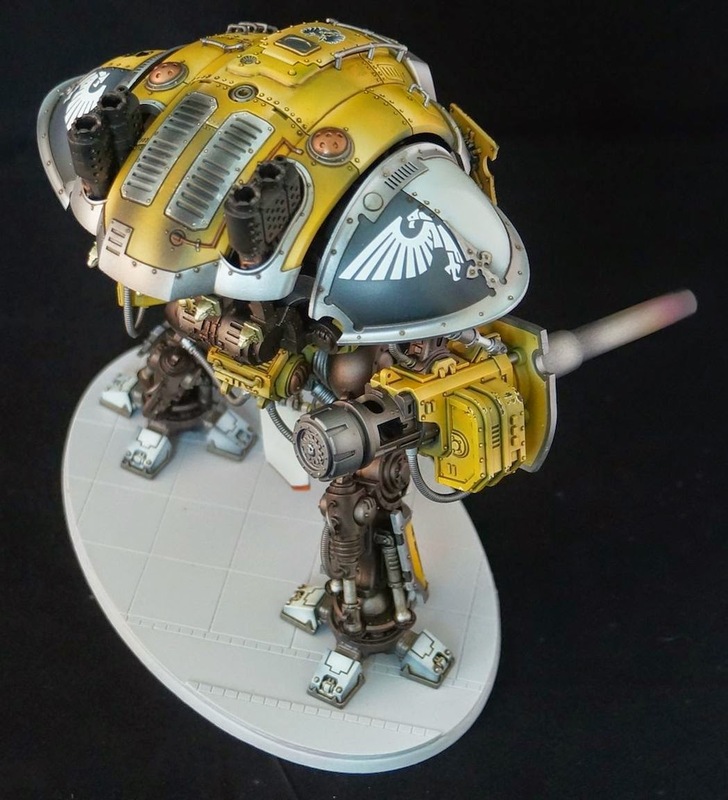 I was hoping to use my drop pod, and at least one of my contemptor dreadnoughts, but the points made it difficult. What you see here is a a mish mash of what I have painted that happen to fit into the points allotment. So I wouldn't mind if one of you kind internet gamer folks, reviewed my list and offered suggestions. 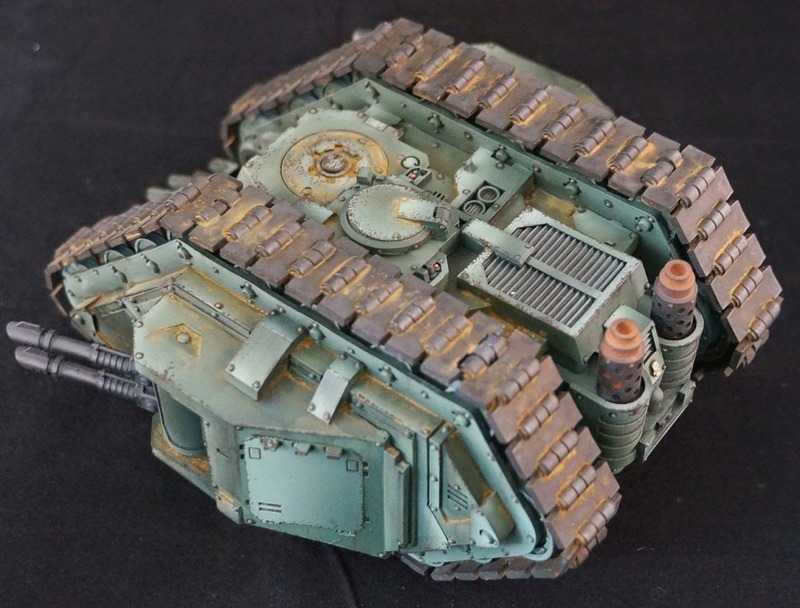 I have a lighting, a drop pot and two contemptors armed with close combat weapons and either lascannons or auto cannons. 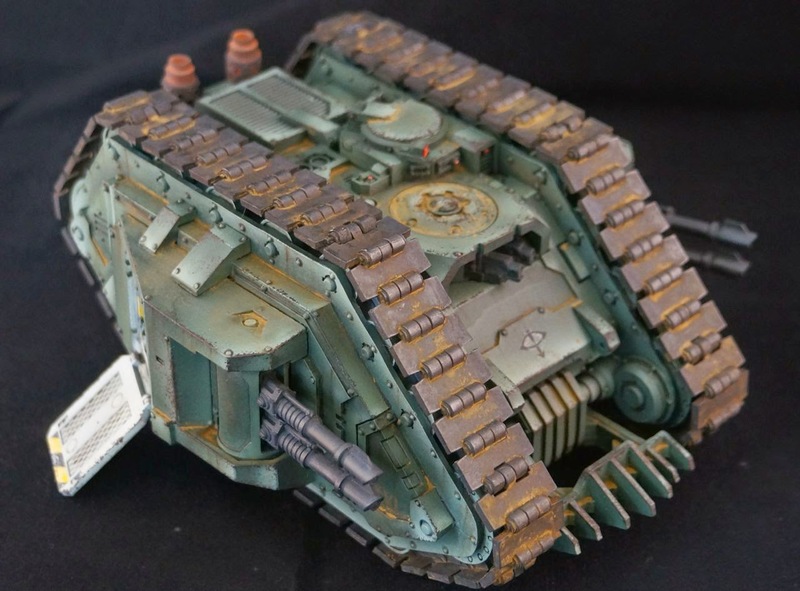 I could also add a single duel lightning claw terminator. 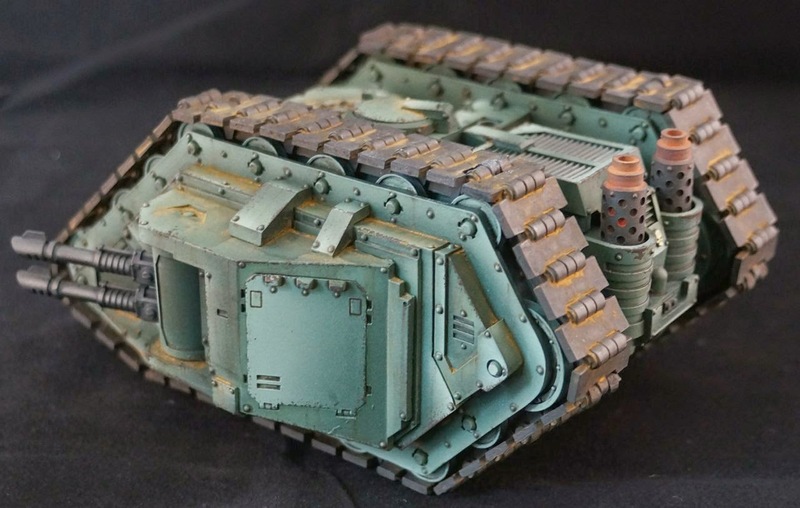 A basilisk could be added if I start painting it when I get home from work tomorrow, but that may be a stretch since I am still pinning the tac squad to their bases. I added the obligatory unfinished unit shot that accompanies every tournament I attend. 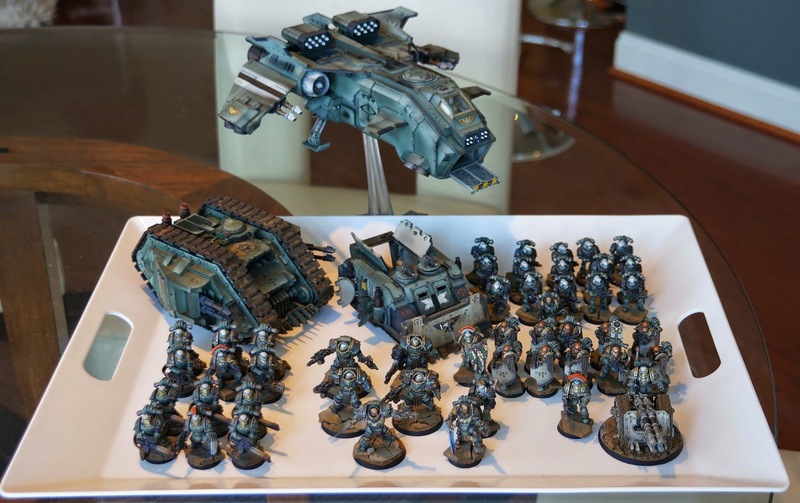 I had less to paint this year than for NOVA last year, but it was still a sprint to get 16 marines painted in time. 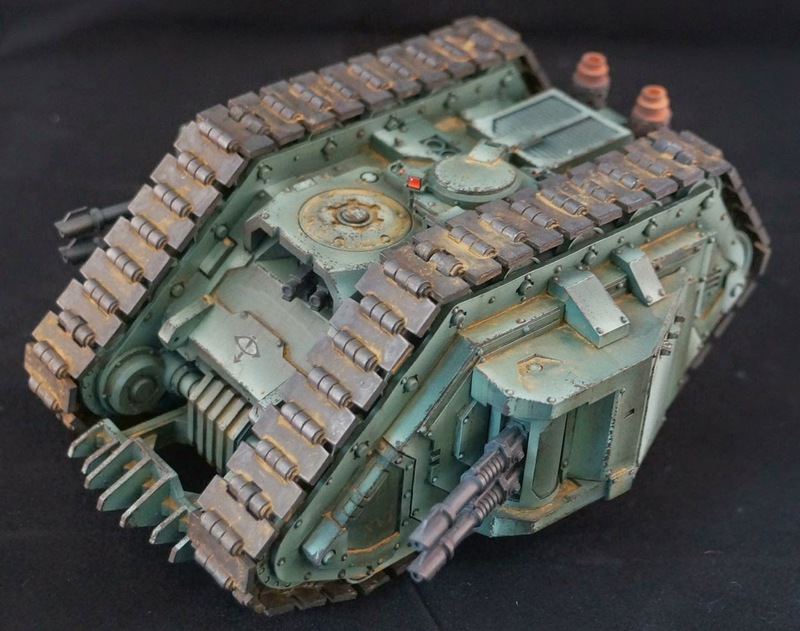 A reminder for those who like this model. You can win it, along with a whole host of great models painted up by some of my favorite artists. Donations go to Doctors Without Borders, a great charity that I am proud to support. This may be one of my best paint jobs. It is still in progress, but to my eyes it looks far better than some of my work immediately preceding it. 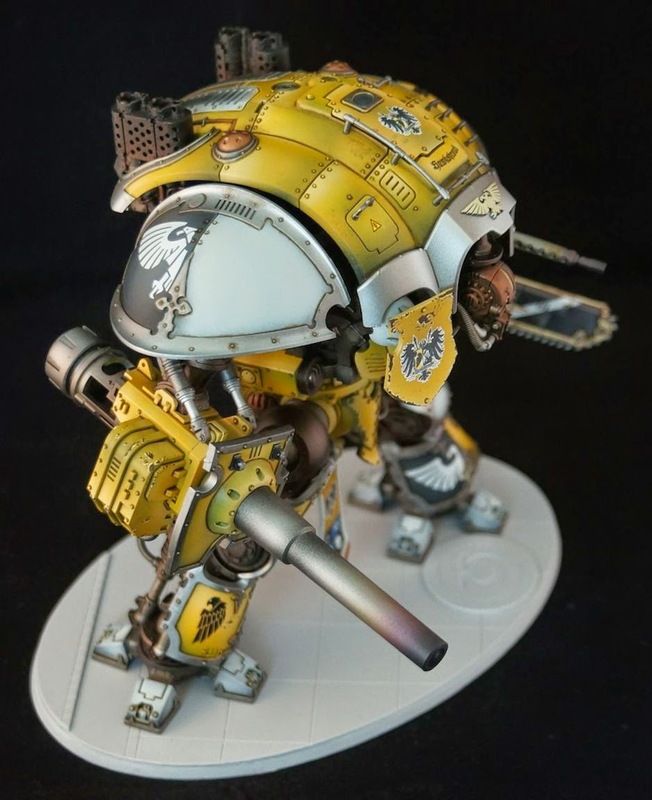 That is good news for you(unless you hate yellow), because you can win this Imperial Knight! 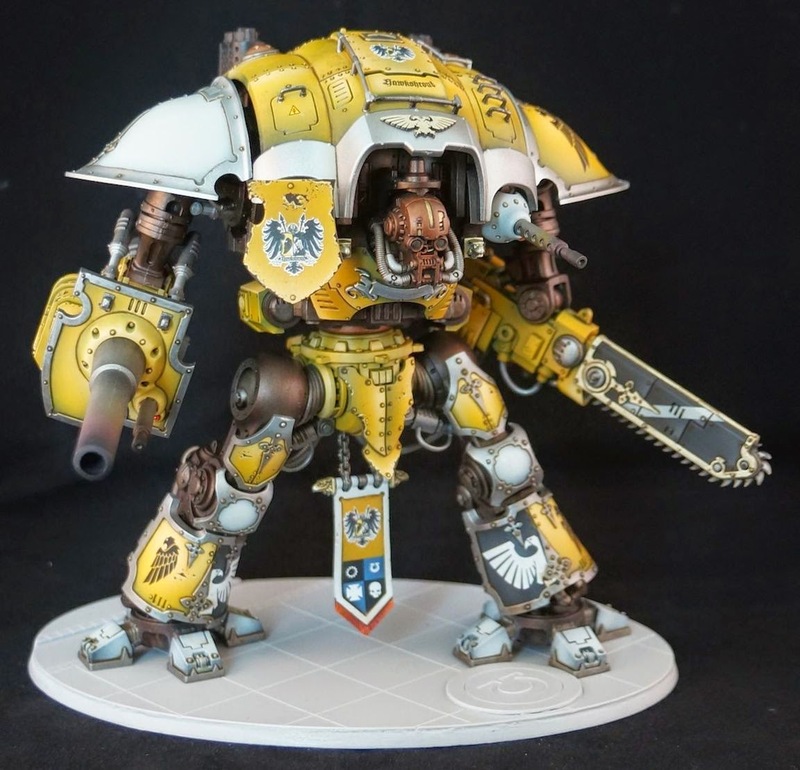 This model will be raffled off as part of the NOVA Open Charity Foundation's Ultramarines army. Proceeds go towards Doctors Without Borders, an organization my wife and I strongly support. 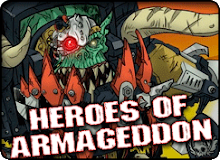 If I am remembering properly, the Heroes of Armageddon project earned around 30,000 dollars for charity. Can we surpass that? Think of all the good it will do. 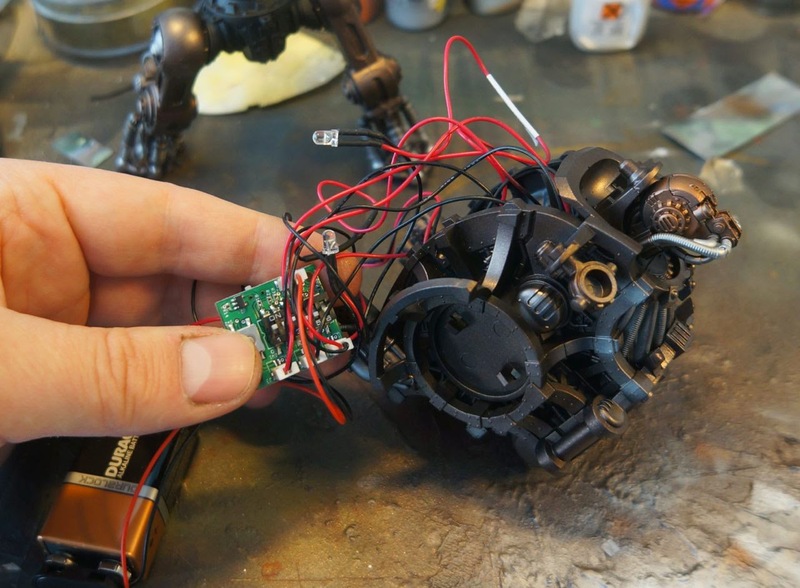 This has been an unusual build since it involved electronics and fiber optics, but I am really pleased with how it is coming together. 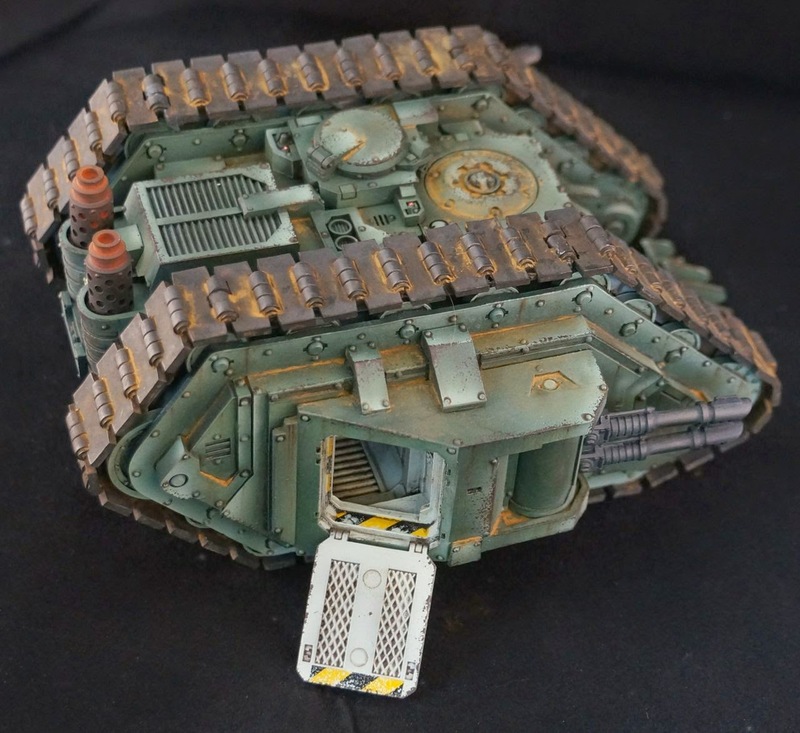 The rhino doors are just tests that show the streaking that will be applied to the model after the chipping has been completed. One of the effects which does not show up so well in photos, but looks great in person is the airbrush shading of the metal trim. In photos it just reflects, but in person the color modulation from bright steel to dark metal can be seen. I may use a little dull coat to cut down on the reflection and make it stand out more, but that is tbd. 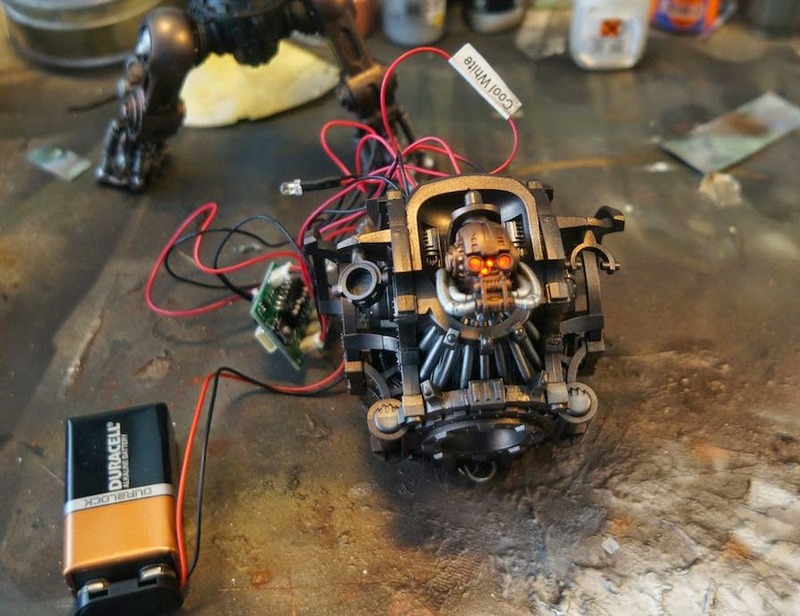 With the lights off the sanded fiber optics can be seen in the eye sockets. I used a square fiber chunk behind the two small center sensors. I think the fiber really tones down the light and makes the model look good when the power is off. Chunks of aluminum foil were added inside the smoke stacks to break up the light and make it look more like fire. The effects board can be seen here. Those little dip switches control the three sets of light strands. For the past 4 years I've had the privilege of being part a charity army raffle. This year, like the three before it, Doctors Without Borders will be receiving the proceeds. 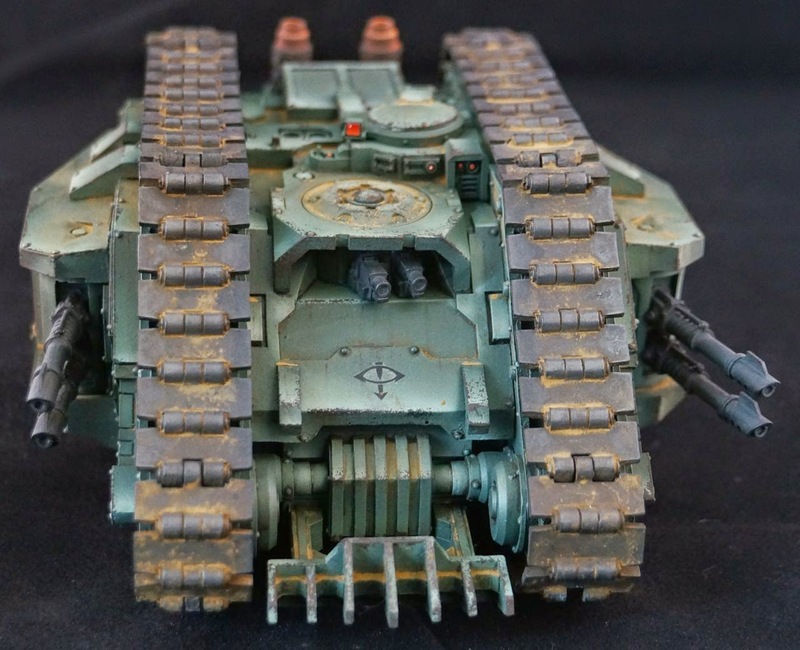 My painting and techniques have changed a lot in the past few years, as my exposure to traditional military modeling, oil paints, and weathering powders crept into my 40k work. This year, I get to experiment with two new techniques, led lighting and crushed glass. The guys at Powered Play Gaming provided all the lighting, and even sent along an effect generator so I could make the eyes pulse slowly. 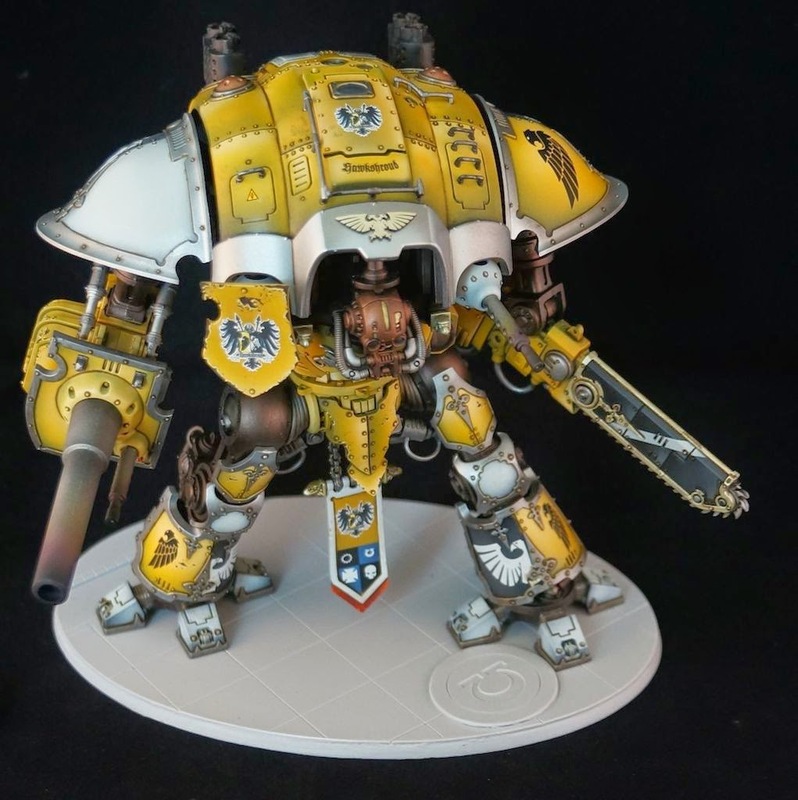 Whoever wins this army will be able to change the lighting effects at will by taking the top of the knight off, and flipping some dip switches. I plan to set the default effect to a slowly pulsing red glow for the eye, flashing yellow for the smoke stacks, and cool white strobe effects for the sides. In the video above the faceplate is off so you can see the aluminum foil that I used as a reflector on the inside of the skull. 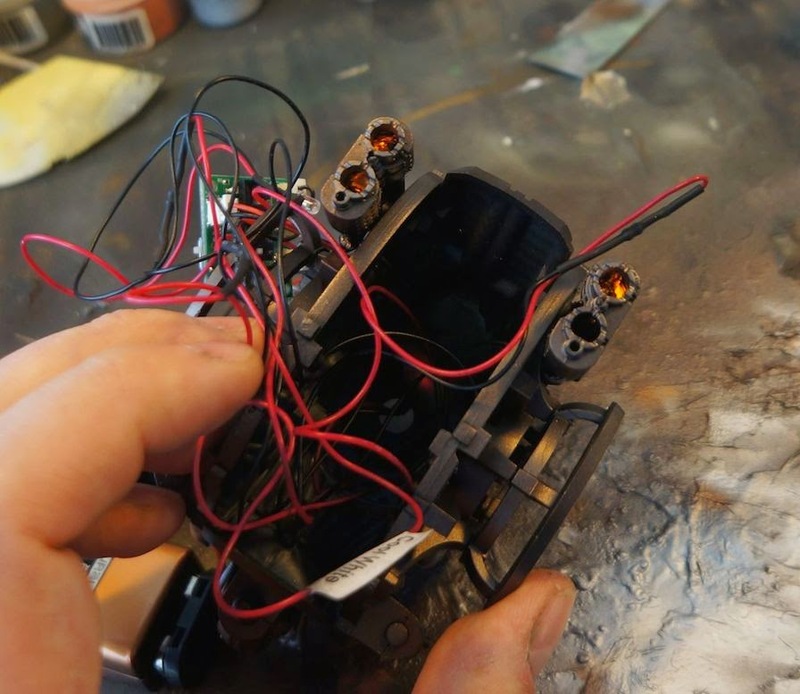 The faceplate had the eyes drilled out, and fiber optics installed as well. In addition to cool lighting, we have some pretty awesome bases which will be topped off with ruined columns and crushed glass. I've seen crushed glass used several times, but this will be a first for me. Good thing I am trying it out on a giant custom base. 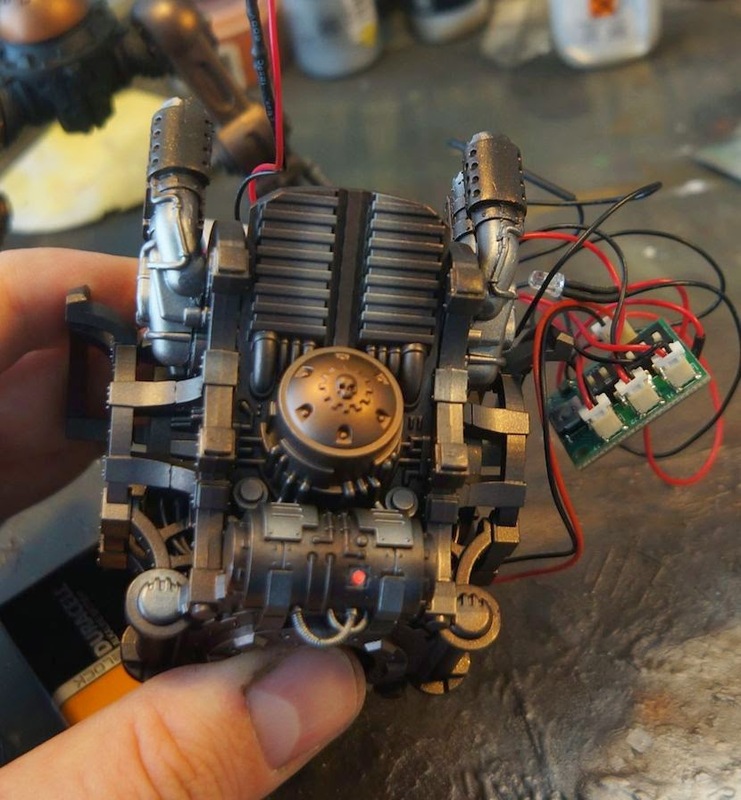 Speaking of bases, Justin from Secret Weapon Miniatures teamed up with Thomas Wynn and Team Leader Dave Taylor to create the custom bases seen here. So not only do we have lighting, crushed glass, and SWM columns, we have specially produced charity bases. Justin is donating half of every sale of the Omega Bases to the NOVA Open Charitable Foundation. More updates are to follow now that the electronics are in place. It has taken a while, but I am ready to prime and paint. So what color scheme would go well with ultramarines on a dark snow covered base? I was thinking a red Mechanicus scheme or house Cadmus. 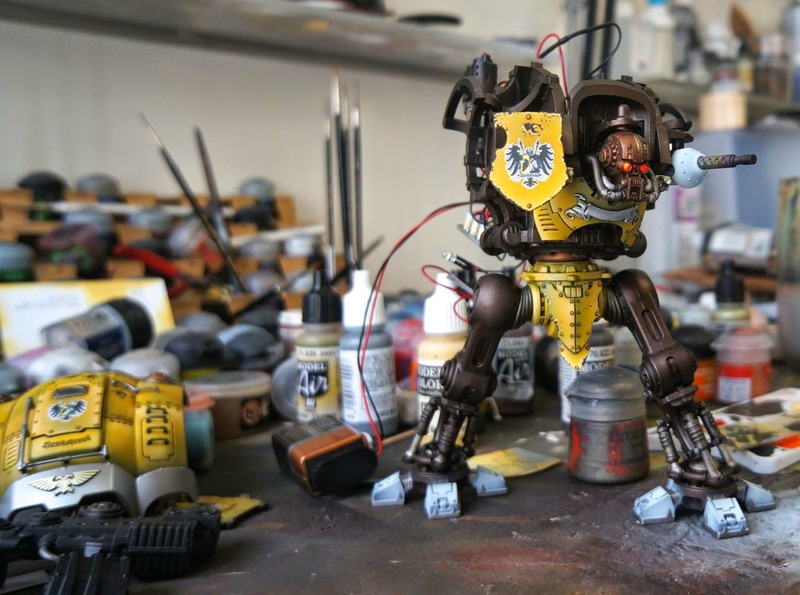 *Edit Hawkshroud looks like an awesome color scheme to paint, and perfect backstory for a charity army! 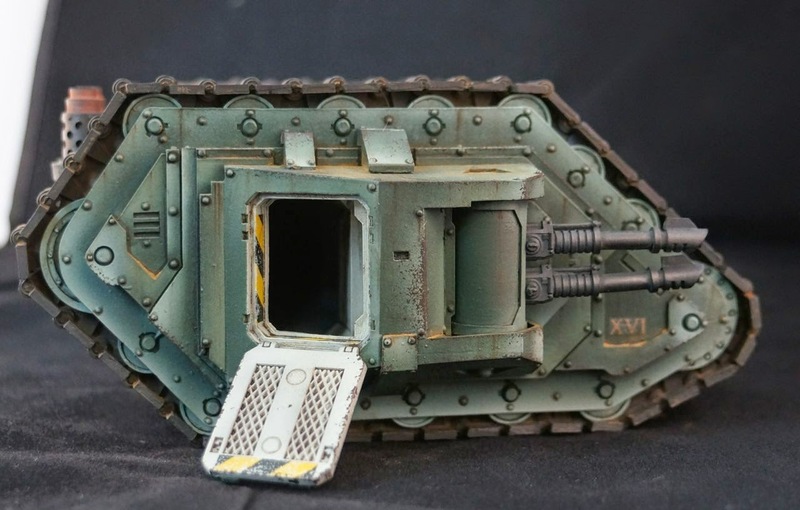 As usual, I've grabbed some spare rhino doors and used them for a painting test. 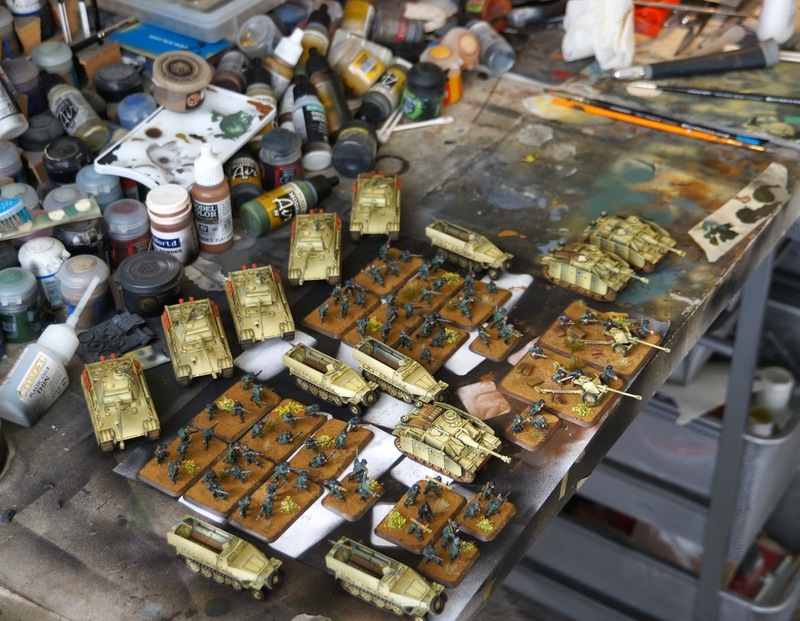 With the Old Line Massacre coming up it was time to stop painting flames of war and get another 30k vehicle ready. While I had thought I had adequately compartmentalized my painting to that of military and 40k, there is definitely some spill over here. 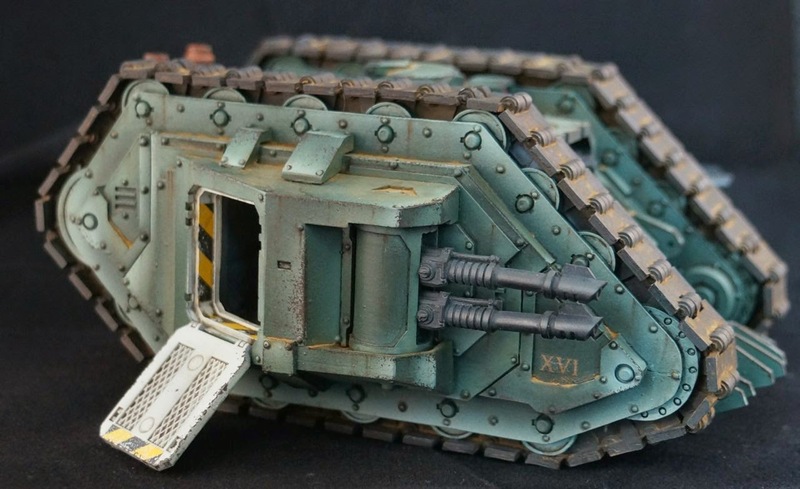 I don't usually paint with pigments on my 40k models, but since I had been doing that with all the german tanks I gave it a shot. So on to the model. First off, I hate proteus tracks. There is not enough detail to make them terribly interesting. 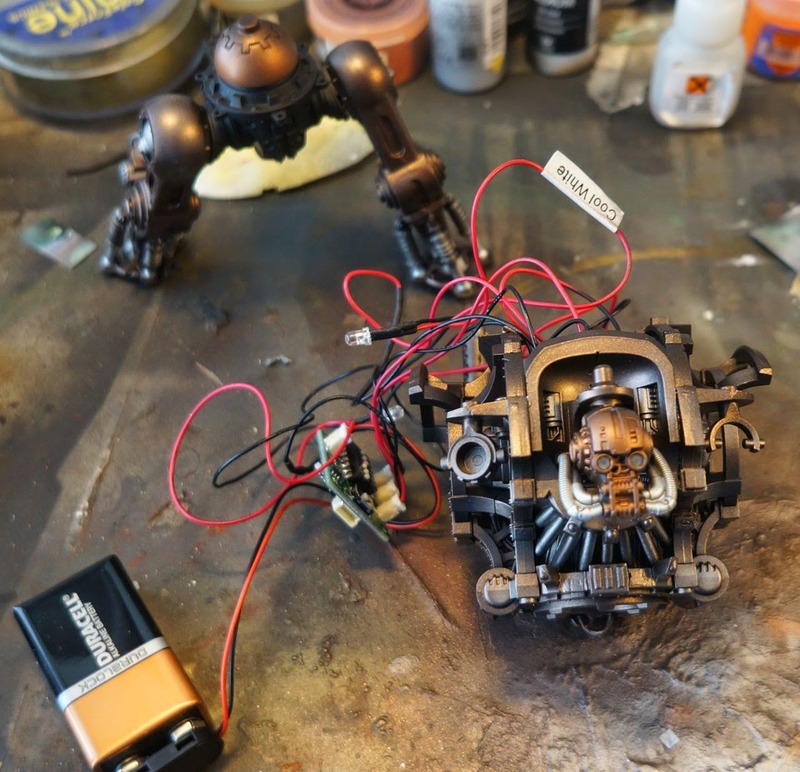 While it is hard to see in these photos, I based the tracks with a black/brown color, and then used white spirit to distress the paint job, producing chips all over them. After that a dust wash followed by metallic pigment followed up. The metallic effect is subtle. In the photos, the sheen does not come through. 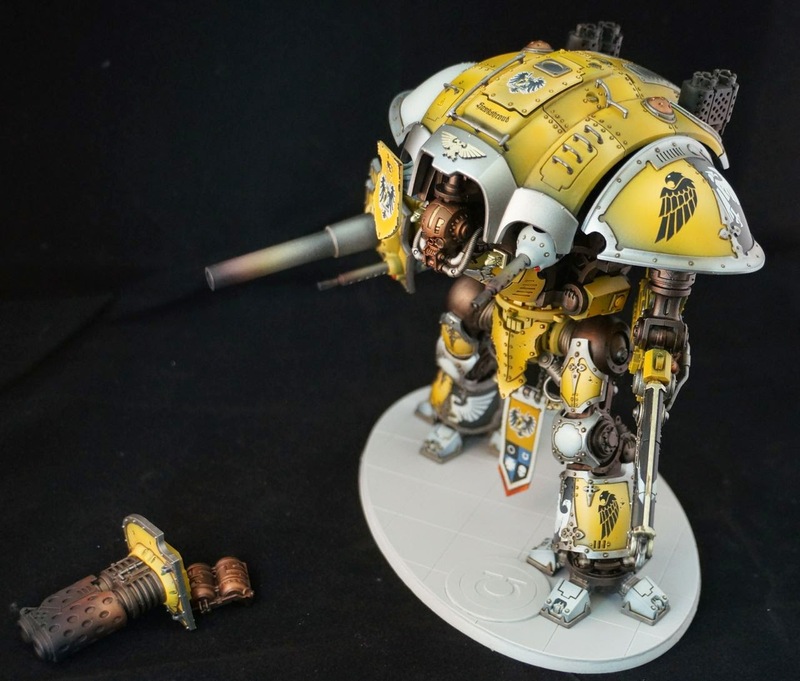 I experimented painting on metallic pigment on the weapons as well. Up close the buffing shows through, but here it is a little difficult to see. 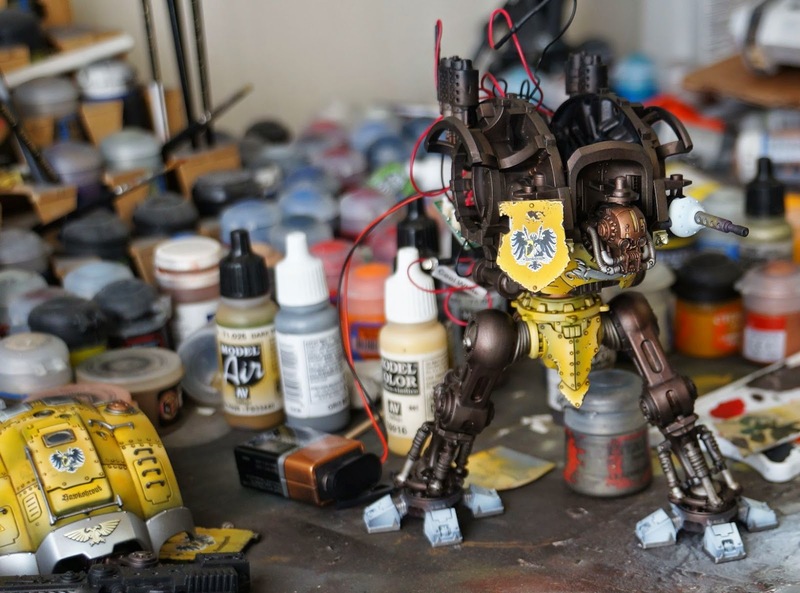 After all of the color modulation was completed I applied forgeworld decals. What I experienced was an epic failure. 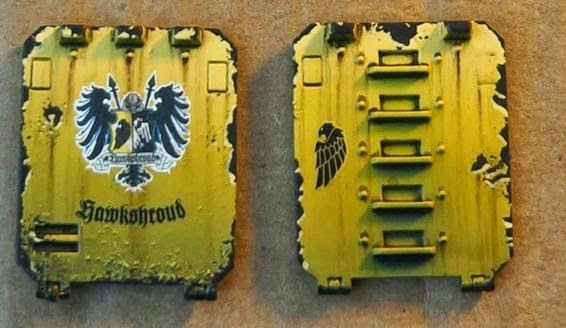 I've had specific trouble with the Sons of Horus transfer sheet, and I just can't figure out a combination of techniques that would work. At this point I am ready to blame the material. My traditional method of gloss coat base, followed by micro set and then finished with microsol, failed miserably. I am beginning to think that this decal sheet has imperfections in it. It is time to order another one and see if this was just damaged or from a bad run. On the positive side of things, the leaked rules changes for 7th edition look fantastic. It feels like GW took a critical view of the state of 6th edition game play, and tried to address the main issues. I am really excited to see how it shapes up, especially after all the gloom and doom from the BoLS writers. All of that sky is falling crap may have been good for BoLS adsense, but I do not think it was good for the hobby. Last week I set myself the goal of having one FoW army ready to play this Sunday. I think I accomplished it. 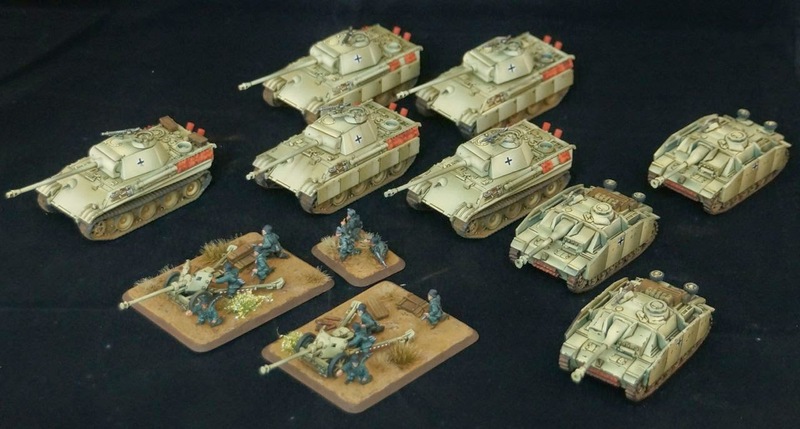 I was hoping to have both the Germans, and the British complete, but my lack of WW2 knowledge lead me to paint the British Sherman tanks as if they were US Olive drab tanks, and I am now left with the decision to try and brown them up or strip them and start over. Did the Brits ever provide Firefly tanks to the US? I sped through the painting of the rest of the infantry. Quality took a dive here, as my goal was to get them based last night so the weathering powders would have the chance to dry. There are a couple of hands I forgot to paint, and probably another wash on the faces is needed. I thinks these guys will do the trick though. Hopefully I've kept them within whatever the tabletop standard is. 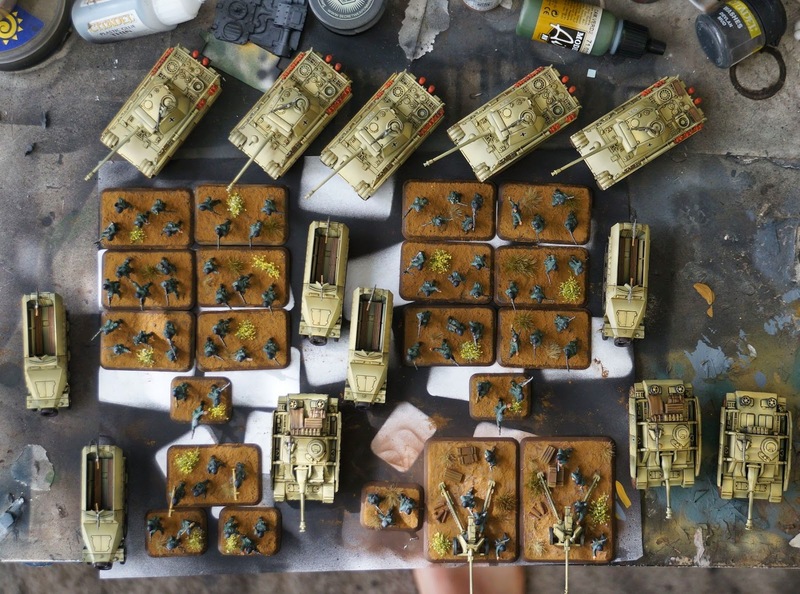 The tanks are still pre-weathering, but I they look good enough for a practice game. So, with half of my goal complete, I should be able to play a small game tomorrow. I just need to figure out what magical intel briefing to use with this set of models. So what do I like about flames of war? The rules are straightforward and look like they will be fast and fun to play. Overall, it feels like a bunch of amateurs created a great ruleset, and then had to figure out how to build a company around it. That home grown feel is appealing. I just wish they had compressed the rule book into half as many words. The rule book is amongst the dullest I have read. 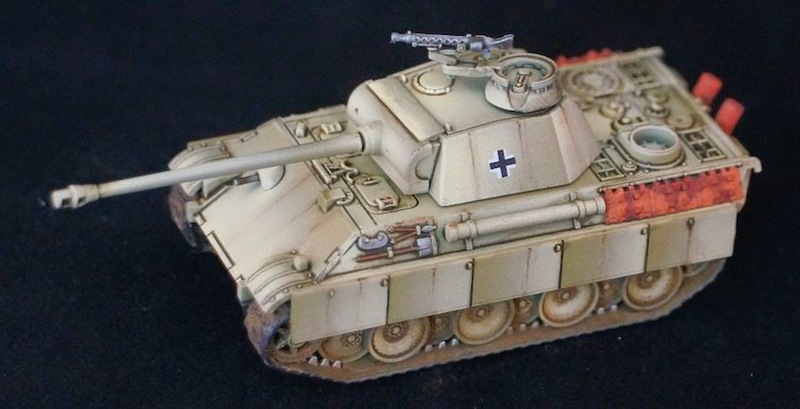 After painting the Stug G's from the Open Fire starter kit, I had the hankering for painting some panthers. Not knowing what type to make, I settled on the Panther G, since it had the coolest looking equipment. One of the panthers has oil streaks applied. 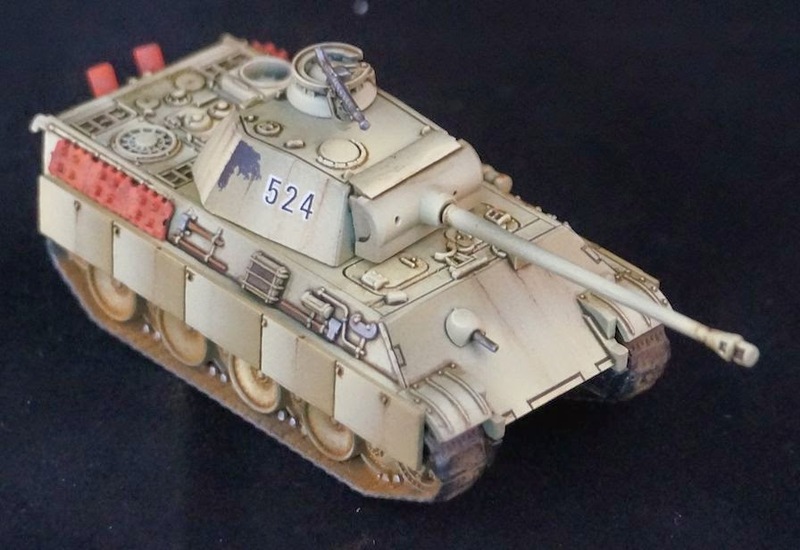 The rest will get the same treatment, but after my wife said she hated the paint chipped Stug, I thought I would see what a tank would look like with oil streaks alone. 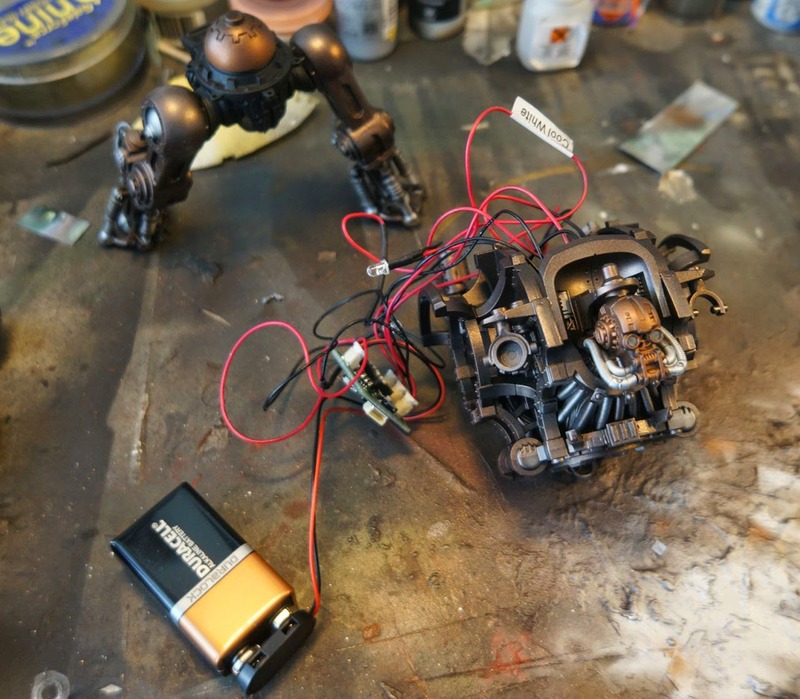 I think it can work, but I do need to put some paint chips in there, if only to provide narrative to the rust streaks. 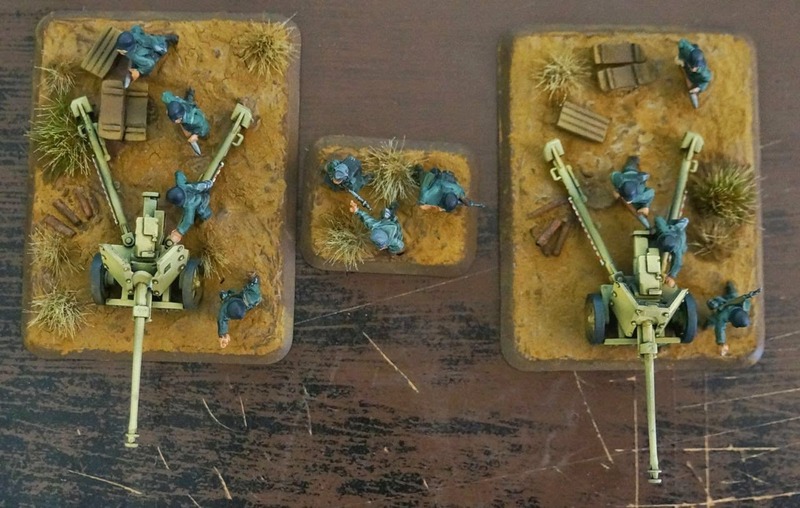 Other than that, I added yellow flowers to the german bases, and put together the allies side of the box. Two hours later and two clamps per tank, and I finally have the Shermans and Fireflys ready for paint. 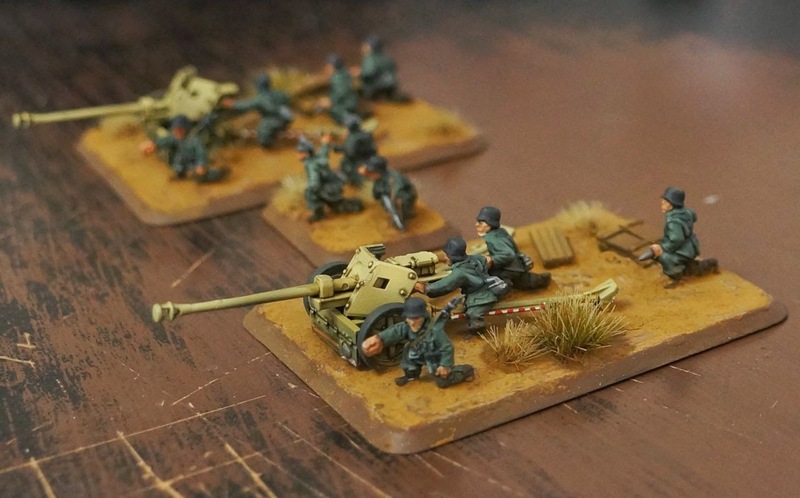 I enjoyed painting the Plastic Soldier Company Panthers. 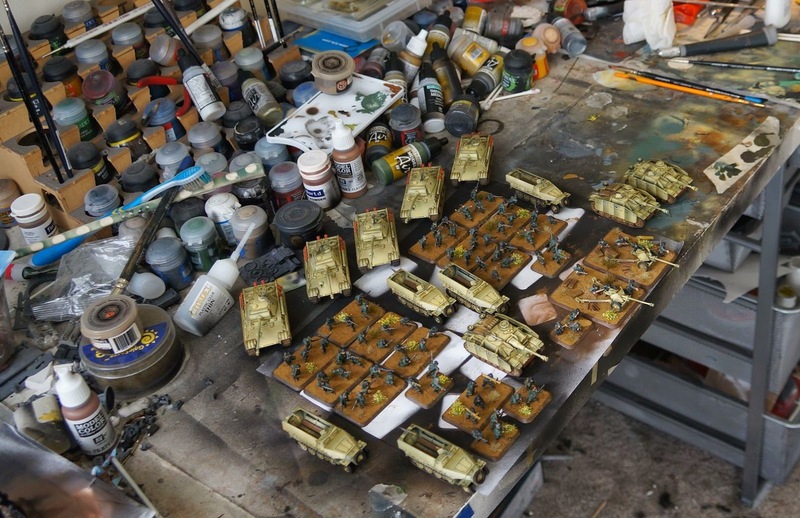 I am not sure I will enjoy painting the Shermans. Maybe I have just been spoiled by Games Workshop, whose models are crisp and well detailed. I'm beginning to think that I should just buy models from anyone but Battle Front, though it seems a weird way to support a game. The pigments are stilly drying, and paint chipping and streaking is yet to be done, but I wanted to see what these guys would look like based. I don't think it is realistic, but the greenish brown earth provides nice contrast. Now the big question is whether I've managed to reach whatever the tabletop standard for FoW is. I found the figures really difficult to paint, so I was pretty loose with the brush. 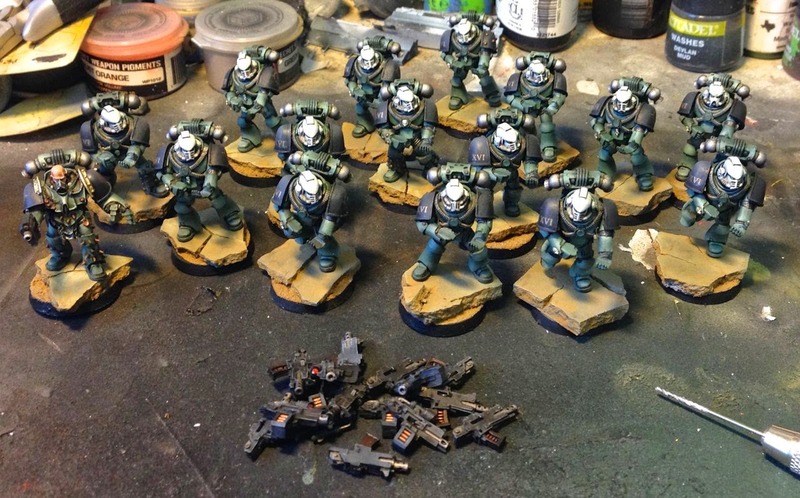 If I paint the remaining 96 guys up to this standard will it be considered a nice army, or do I need to spend as much time as I do on my 40k stuff? I was thinking about painting the trims of each base black, but I am worried it will stick out too much. I rarely paint anything but 40k, but after a year of having the "Open Fire" boxed set for Flames of War sitting in my closet I decided to break it out and paint some models up. 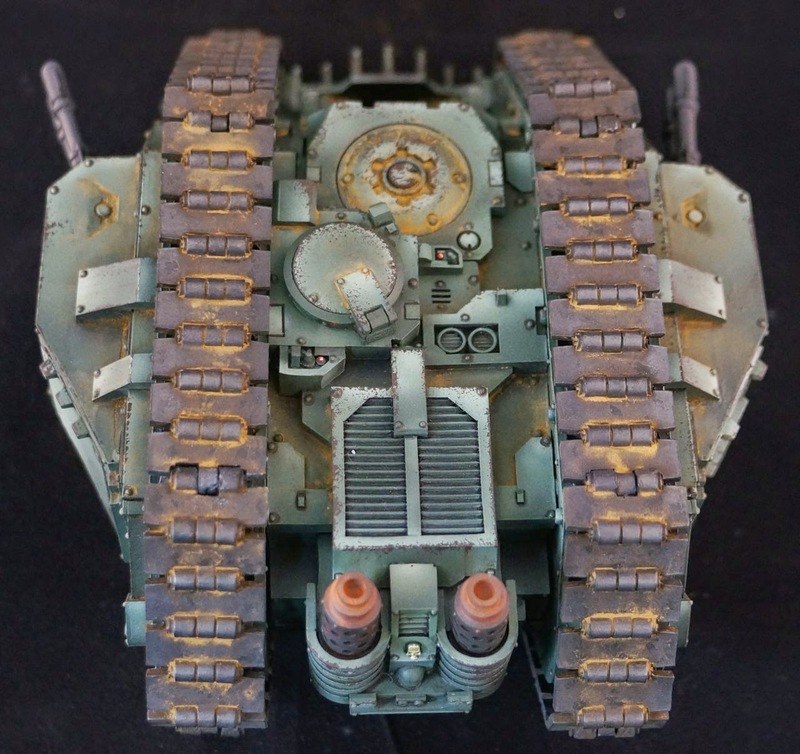 All that military modeling research in order to paint better 40k tanks primed the way. 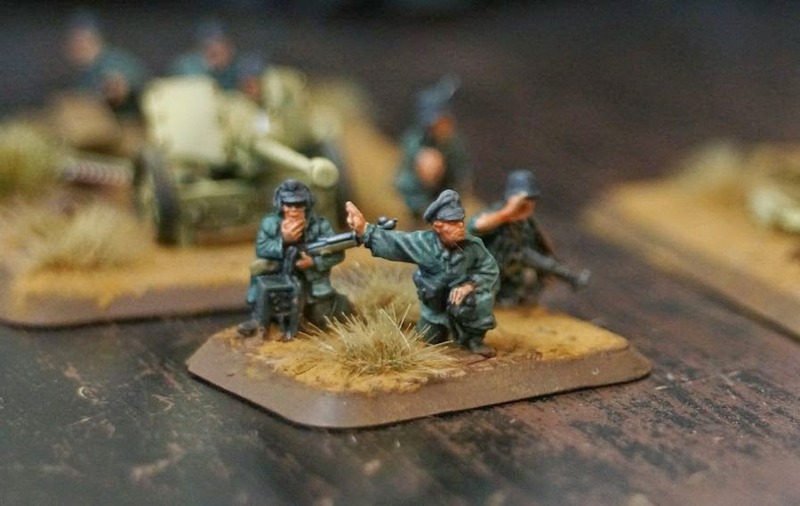 It feels weird to be painting US, British, and German forces, since unlike 40k, in FoW we are dealing with real events. On the other hand, this is just painting. 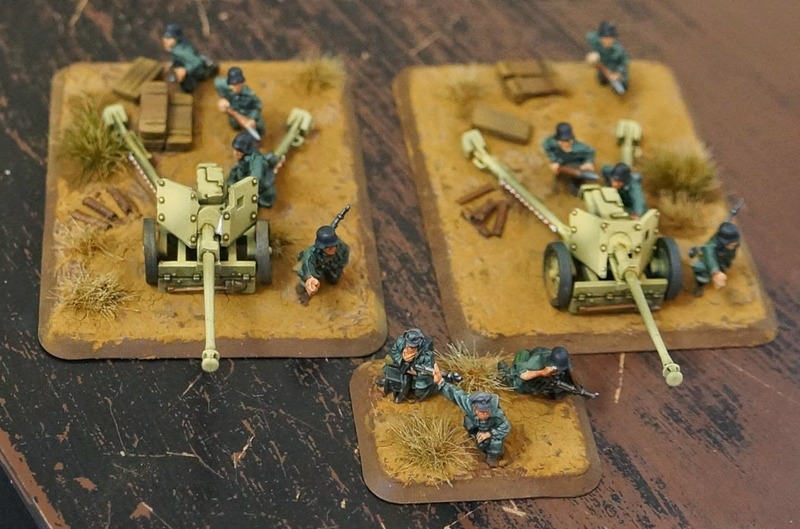 What you see in the photos is the German side of the starter box. The American and British will be painted last. I sort of viewed these models as color modulation practice for my larger 40k models. If I can do it a 100mm scale, then I can do it at 28mm. 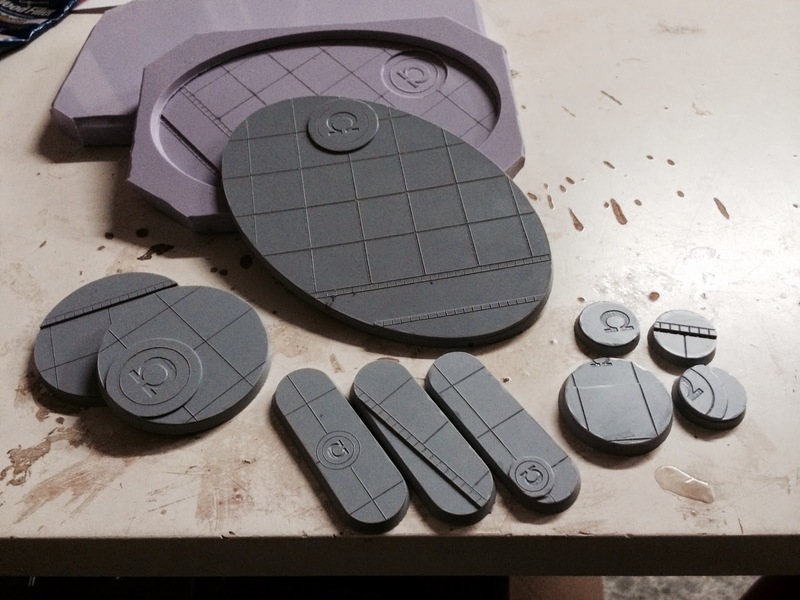 The major challenge here was working with the terrible plastic these are molded in. The more I worked with it the more I hated it. Even weirder, it looks like battlefront sculpted these tanks by hand. The tracks are weirdly rounded and soft, and many details just blur together. I am not sure if all FoW plastic kits are molded in this soft detail, but brittle stuff, but if they are, then I will not purchase any more. On the other hand, I found a shop selling Plastic Soldier Company 100mm kits, and was really pleased with the amount of detail. I purchased the Panther box set, and enjoyed building them, despite having no idea what variant I ultimately produced. There seems to be a profusion of kits that mix Panther A, D, and G variants, so I went with the G because it looked better. I think the A, and D versions are swapped, but it also looks like the G versions front ball turret thing should be on the A as well. I've reached the point where I need to paint up some infantry, but I honestly have no idea how to achieve this. The models are so small I can barely see them. My plan so far is to airbrush white from the top to shade them, and then dust them with semi-transparent german field grey. 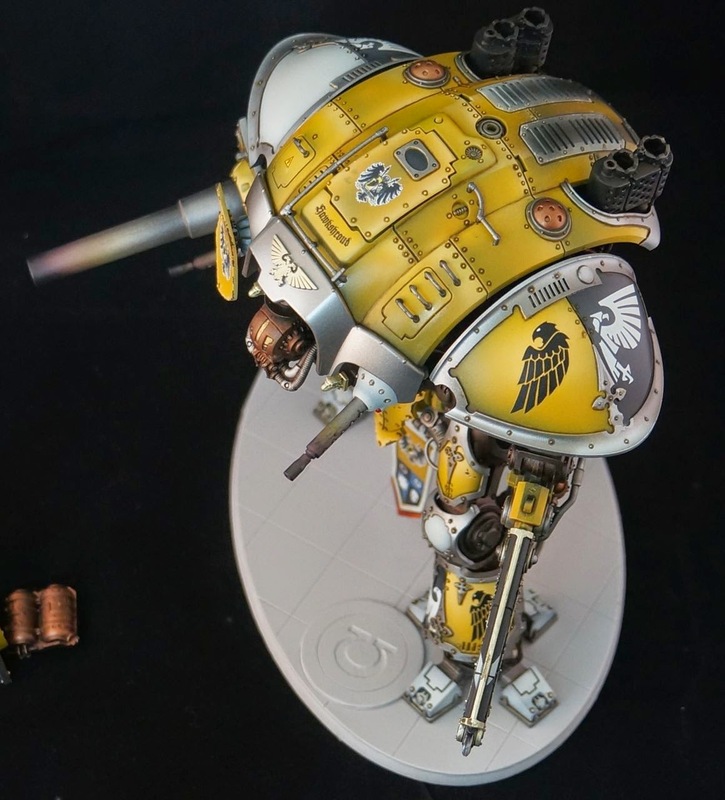 Additionally, do people base them first and then paint them? It looks incredibly difficult to paint them once based, but basing second has its own problems. Now on the big questions. 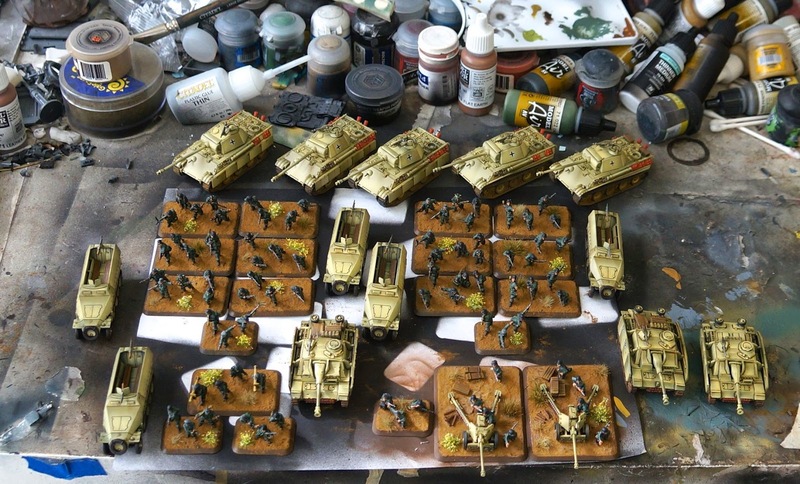 Do I have to add brown and green camo to the tanks, or did the Germans have some units left yellow? I tried several practice runs with my airbrush, and none of them came out ok. I'd like to move on to the paint chipping, and streaking phase, but I can't until the base coats are done. I've purchased the starter box, the PSC x5 panther box, and the PSC x5 halftrack SdKfz 251D box. Is there a way to make a list that uses these? The army list included in the box was not very helpful, and after reading PDF after PDF, I really don't know where to start, or what would be acceptable for the FoW community. I think this is a major barrier to entry for a new player, and problem for Battlefront. I am not interested in becoming a military historian of WW2, but with the amount of books and documents it feels like I have to.